I’ve read a few posts about the best way to react/what to say when a friend or member of your family has a baby with DS and a year down the line I feel I can add my 2 cents. As with anything in this world we’ve found ourselves in, I often wonder what I would have been like on the other side of the fence… If a close friend rang me to say they had just had a baby and – shock – the baby had DS… Would I have said the right thing? A couple of weeks ago we were at my brother’s 40th birthday party. Many of his friends had last seen me when I was pregnant, or even before that, none had met Audrey yet, a few had seen her via Facebook pictures and videos. Now, the drink was flowing and it must be tricky chatting to someone who’s had a child with DS – do you make reference to it or not? But two of my brother’s friends (both male) had similar conversations with myself and Ted that we discussed the following day. To be honest, we just laughed/shrugged it off, but we acknowledged it’s a shame people have this response… The general gist (and they were in no way trying to be offensive, both the complete opposite) of their chat was; how well we were “coping”, how it must have been “devastating” and what “a blow” it must have been… Even typing this I’m thinking, “oh it’s not such a bad response”, and as I’ve said, they weren’t trying to be negative, but the truth is the best responses have been those who either don’t mention it and just ask how she is, how parenthood is treating us etc. or those who ask questions about DS in a genuine ‘what does it mean’ kind of way. Yes, at the time we probably were devastated, but that seems like such a wrong reaction now. With the knowledge we have now, I’d never describe it as devastating. I’d say we were shocked, but hey, she’s perfection now, so we’re over it. I also wanted to laugh a bit about “coping” because at the moment we are just coping with having a baby… Same as any other parent, no one would mention how a parent of a typical baby was coping so well with handling their little one. Our friends have actually all been fantastic, we really can’t complain. Audrey has a massive fan club, a ton of love and 99% of the time people say the right thing. 1. Congratulate them. Please. This is by far the best response. 2. Ask the normal questions about time of birth, weight, whether the little monkey is sleeping well etc. 3. Do express concern over any health issues etc, but don’t make assumptions about what the DS means (oh you’re breastfeeding? I heard they can’t breastfeed? Does baby cry? I don’t think they really cry much do they?). 4. As time goes on, be mindful that milestones might be delayed (we are constantly asked if she is walking yet and we haven’t got to crawling yet). Perhaps just asking how the baby is doing in general is an easier question for parents to respond to. 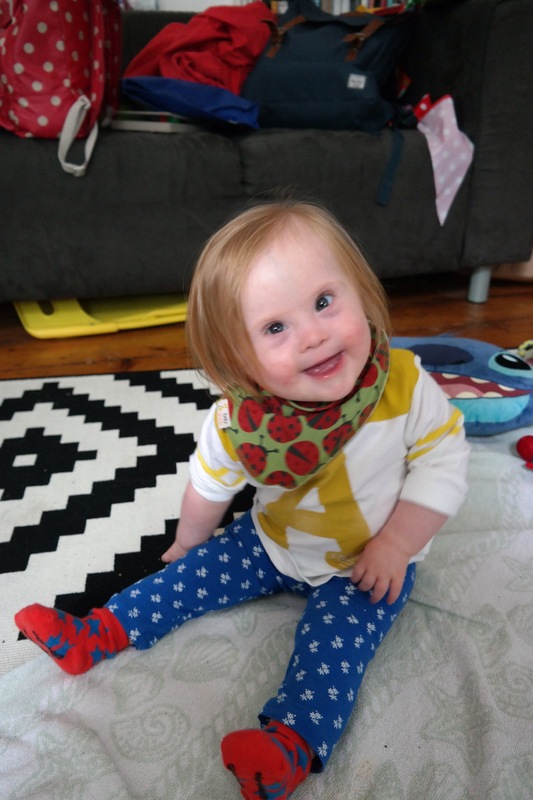 I’m very proud of Audrey’s rolling, babbling, waving, clapping, kisses… Oh I could bore a lot of people with things she’s achieved, but it’s not my favourite thing to explain we don’t know when she’ll be walking. Just try to remember, a baby coming into the world… That’s an amazing thing that needs to be celebrated. I wish we’d have celebrated more in those first difficult days… We are certainly making up for it now!